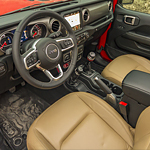 The Jeep Wrangler is a popular SUV with a familiar name and innovative features. The new windshield and lighting options ensure great visibility without sacrificing style. When you want to feel the wind in your face, the fold-down windshield is easier than ever to operate. A new, permanent sports bar at the top of the frame gives extra stability to the passenger compartment when the windshield is down. For night driving, you can choose a package with bright LED headlamps, fog lamps, and daytime running lights. You can also choose LED taillamps. We have Wrangler models at Porterville Chrysler Jeep Dodge Ram that let you see how skillfully Jeep has combined modern technology and the traditional, rugged look of the Wrangler. For day or night driving, the Jeep Wrangler has you covered. One test drive is all you need to see how the visibility features help ensure a safe, fun driving experience.